Today it is my honor to interview K.G. Stutts, author of Mirror Image and the rest of the Mirror Series. Welcome to The Adventures of the Everyday Fangirl K.G. and thank you for letting us get to know you better by agreeing to answer the following questions! Some of the names have very special meaning for me. In my Mirror series, the name Madison Mackenzie was originally going to be my daughter’s name, if I ever had a baby. I’m getting older and the likelihood of having a child is still there, but growing slimmer. I wanted the name to live in something I consider my baby, my first book series. So Mack and Maddie got their names. Some of the character names are based on friends or family. Elizabeth is one of my nieces. Will is a childhood friend. I do like to give little nods to people of places from time to time. I’ve always been a sci-fi fan. Growing up, my dad and brother would watch Battlestar Galactica, Star Trek, and Star Wars. I was enthralled by the dangerous locations, the aliens, the technology. I was hooked. My dad and I still have discussions about Stargate SG-1 and was really sad when it and Stargate Atlantis was cancelled. And the romance… I’m just a romantic at heart. I wear it on my sleeve. Are writers sane? I haven’t quite figured that part out. Honestly, I get cranky if I go a while without writing. I am the marketing manager for my indie company so lately my focus has been on getting a new author released and setting up for a podcast I will be hosting for my company. It’s been two weeks since I’ve written, even though there are scenes in my head. I can feel it! I do a lot of research depending on the story I’m writing. For my Amethyst Chronicles, it was different weaponry and fighting styles. For the Mirror series, it was biology and genetics. Sometimes it’s the area the story is taken place. I cannot stress the importance of research, even if you feel familiar with the subject matter. It adds depth and realness. I’m naturally very silly and friendly. Laughter is the key to a happy heart, in my opinion. I try to do it often. Seeing a being being mistreated, either a person or an animal. Thank you again K.G. for stopping by and letting us get to know you better! 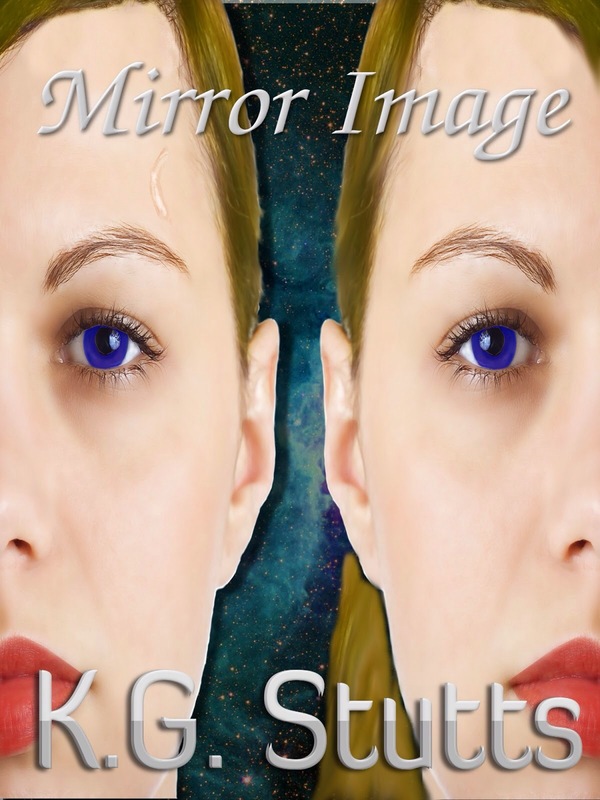 Mirror Image published by Distinguished Press is available to right now for the low price of $0.99 on Amazon.com. Madison Mackenzie Rhodes, Maddie for short, would call her life “comfortable.” She works in a call center, lives with her best friend of fifteen years, and spends most of her free time with her family. Her entire world is turned upside down when she finds out that she is a clone, created to hide the secret that we are not alone in this galaxy. Her counterpart, going by the nickname Mack, works for the Intergalactic Security Commission, which works with a coalition of other planets that protect each other and create technology. When an enemy rises from within the ISC that targets both Maddie and Mack, they must work together to save their lives as well as the planet. K.G. Stutts is the author of several sci-fi romance series as well as several romance stories. She has a degree in massage therapy. As a contributor to Independent Writers Association (IWA) her insights can be seen regularly there and on her own blog at kgstutts.blogspot.com and her website at kgstutts.com. When she’s not weaving words, she enjoys reading, playing RPGs, hockey, wrestling, and football, and is a big sci-fi nerd. Currently she resides in North Carolina, USA with her husband, Brad. You can learn more about K.G. and about the rest of the Mirror series by following her on Twitter, liking her Facebook page, and by visiting her on either her blog or her website. 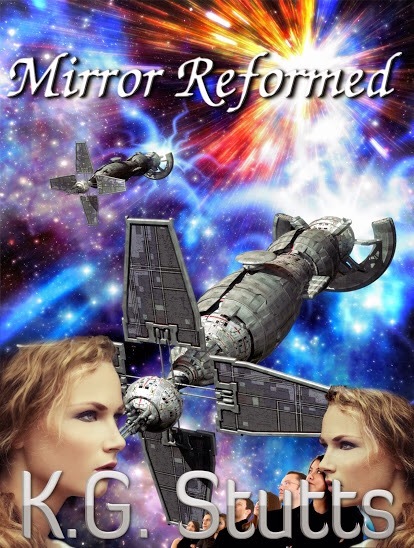 It is my honor to present an excerpt from Mirror Reformed the final book in KG Stutts’ sci-fi romance trilogy. The team stared blankly at their former commander, trying to comprehend his words. The statement echoed in Maddie’s mind, making her hands shake. “That’s insane,” Seth blurted out after several quiet minutes. “Remember my warning. What I said is hard to believe, but it’s the absolute truth.” Charlie looked unabashed at the group’s disbelief. “Charlie, what’s going on?” Maddie asked. “Most of you know the story of how the ISC was formed,” Elizabeth began. “Rest of the story?” Maddie looked over at John who looked just as confused as she did. Charlie pulled up a video on the monitor and pressed play. The screen came to life as a young boy wearing wire-rimmed glasses and sandy blond hair falling in his eyes smiled and cleared his throat. The team stared at the monitor long after the screen went black. “That’s not the pressing issue,” Maddie interjected sheepishly. Maddie turned bright red when Mack turned and glared at her for the interruption. After a moment, though, Mack relaxed into a reassuring smile. “How much time do we have?” Jackson asked. “Judging by current speed, they will be here in four days,” Elizabeth stated. “Four days isn’t a lot of time,” John muttered. The former commander instantly broke eye contact, looking down at the floor. Even Elizabeth wouldn’t meet her gaze. “I see,” Maddie solemnly said. “See what?” One of the guys, Chris, asked. “None of us made it,” Seth replied. “Well, that’s certainly comforting,” Jackson gravely said. “Do we have a plan?” Mack asked, shifting uncomfortably in her chair. Elizabeth and Charlie exchanged glances before turning back to the group. The look on both of their faces made Maddie’s heart drop into her stomach. “Nothing? You’ve got nothing?” David sputtered out the question. “How did we do it before?” Chris asked. “We’re … not sure,” Elizabeth admitted. The ISC’s most dangerous foe, the Synth, is threatening Earth. Mack, Maddie, and their team scramble to come up with a plan to defeat them one and for all. As the planet’s safety is in jeopardy, the team will have to put it all on the line, or give their lives in the process. Buy directly from the Distinguished Press website for $.99! Visit the Facebook event page to get a coupon to purchase this on Smashwords in the format of your preference for a discount. K.G. 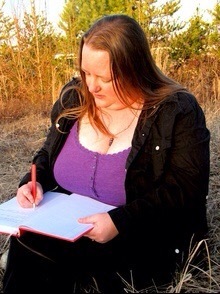 Stutts is the author of two sci-fi romance series as well as several romance stories. She has a degree in massage therapy.